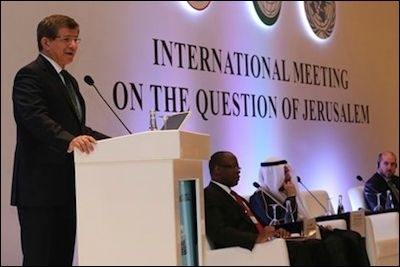 Turkish Prime Minister Ahmet Davutoglu delivered the opening speech of the "International Meeting on the Question of Jerusalem" held in Ankara in May. Turks have a different understanding of what constitutes an occupation and a conquest of a city. The Turkish rule is very simple: The capture of a foreign city by force is an occupation if that city is Turkish (or Muslim) and the capture of a city by force is conquest if the city belongs to a foreign nation (or non-Muslims). For instance, Turks still think the capture of Istanbul in 1453 was not occupation; it was conquest. In a 2012 speech, President Recep Tayyip Erdogan (then Prime Minister) said: "Just like Mecca, Cairo and Istanbul are cities of the Qur'an." In truth, there is no mention of any city's name in the Qur'an. Never mind. "Conquest," Turkey's top Muslim cleric, Professor Mehmet Gormez, declared in 2012, "is not to occupy lands or destroy cities and castles. Conquest is the conquest of hearts!" That is why, the top Turkish cleric said, "In our history there has never been occupation." Instead, Professor Gormez said, "in our history, there has always been conquest." He further explained that one pillar of conquest is to "open up minds to Islam, and hearts to the Qur'an." Most Turkish Islamists think they have an Allah-given right to take infidel lands by the force of sword. It is in this religious justification that most Turkish Islamists think they have an Allah-given right to take infidel lands by the force of sword -- ironically, not much different from what the tougher Islamists have been doing in large parts of Syria and Iraq. Ask any commander in the Islamic State and he would tell you what the jihadists are doing there is "opening up minds to Islam, and hearts to the Qur'an." Both President Erdogan and Prime Minister Ahmet Davutoglu have declared countless times that Gaza and Jerusalem (in addition to Syria, Iraq, Egypt, Somalia and the Maghreb) are Turkey's "domestic affairs." In reality, with or without the normalization of diplomatic relations between Ankara and Jerusalem, the Turks have never hidden their broader goals in the Arab-Israeli dispute: that Jerusalem should be the capital of a Palestinian state; and that Israel should be pushed back to its pre-1967 borders. Until then, it will be 'halal' [permitted in Islam] for Erdogan to blame Israel for global warming, the Ebola virus, starvation in Africa and every other misfortune the world faces. As if to confirm this whimsical view, Deputy Prime Minister Yalcin Akdogan has blamed Israel for democratic failings in the Arab world. "Israel works with [undemocratic] regimes and keeps its ship afloat." So, it is because of Israel that Arab nations have never established democratic culture -- before or after 1948; or before or after the Arab Spring revolts. But fortunately, Palestinians have a new "protector." Al-Aqsa [mosque in Jerusalem] will one day be liberated. The Israelis should know that the oppressed Syrians have a protector. The oppressed Palestinians too have a protector. That protector is Turkey. Just as Bursa [the Turkish city where he spoke] ended its occupation, the honorable Palestinians, honorable Muslims will end the [Israeli] occupation. Just as Osman Gazi [a sepulchre in Bursa] was liberated, al-Aqsa too will be liberated. Al-Quds [Jerusalem] is both our first prayer direction and has been entrusted with us by history. It has been entrusted with us by Hazrat Omar. The last freedom seen in Jerusalem was under our [Ottoman] rule. Al-Quds is our cause. It is the occupying, oppressive Israeli government that has turned the Middle East into a quagmire. Echoing that view, President Erdogan said that protecting Islamic sites in the Holy Land is a sacred mission (for his government), and bluntly warned that any attack against the al-Aqsa mosque is no different than an attack on the Kaaba in the holy city of Mecca. Spot the difference: In the eyes of Turkey's political and religious leadership, Istanbul and its Hagia Sophia (once a Greek Orthodox Basilica) were legitimately "conquered" by the Muslim Ottomans, while Jerusalem and its al-Aqsa mosque (built atop the ruins of the Jewish Temples) are illegally "occupied" by Israel. No doubt, after Gaza, al-Aqsa (and Jerusalem) has become a powerful Turkish obsession, and a treasure-trove of votes, especially in view of Turkey's parliamentary elections next June. And do not expect the Turkish leadership only to corrupt facts. Plain fabrication is a more favored method. All the same, someone, sometimes, would unwillingly reveal the truth often when trying to corrupt other facts. After Hazrat Omar conquered al-Quds [Jerusalem], he was invited to pray at a church [as there were no mosques yet in Jerusalem]. But he politely refused because he was worried that the [conquering] Muslims could turn the church into a mosque after he prayed there. Since medieval historical facts cannot have changed over the past two years, the top Turkish ulama [religious scholar], referencing a most powerful Muslim caliph, is best witness that when the Muslims had first arrived in Jerusalem there was not a single mosque in the city. Why? Because Jerusalem was not a Muslim city. Why, then, do Turkish Islamists claim that it is Muslim? Because it once had been "conquered." Would the same Turks surrender Istanbul to the occupying forces that took the city after World War I because its capture in 1920 made it a non-Turkish city? No, that was not conquest, that was occupation! Had Messrs Erdogan and Davutoglu been schoolchildren, such reasoning might have been called bullying and cheating.